We started with an amuse bouche course entitled “Lure Me In,” which featured a coconut macaroon with lemon curd and red wine caviar and prosecco (my favorite wine of the night). I’m a huge fan of the bubbly, and this prosecco was light and not too sweet – just how I like it. Most people nibbled on the macaroon and sipped the lemon curd and red wine caviar off the spoon, but I was tacky and poured the lemon curd on the macaroon to enjoy both flavors at once. It was delightful. 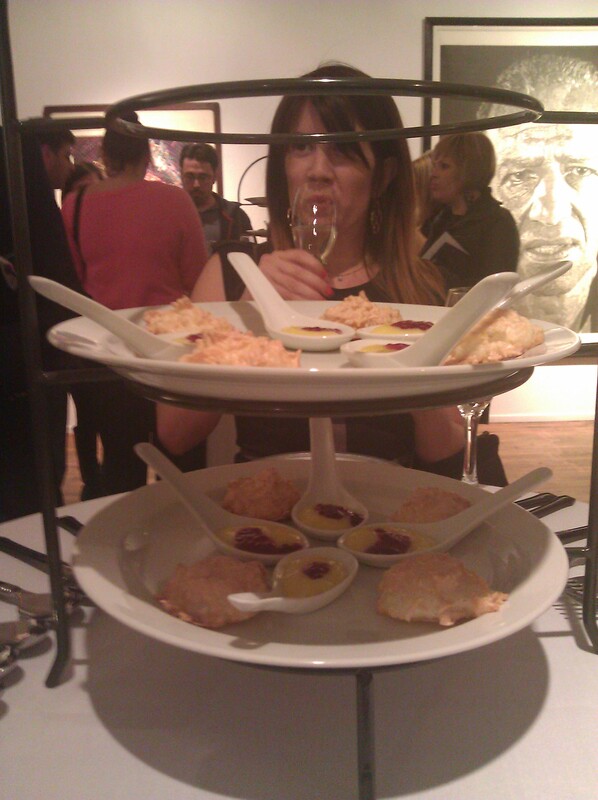 The coconut macaroon was light and moist, and the lemon curd and red wine caviar was a delicious accompaniment. The second course was “Take Me on a Picnic.” The cupcake was a cheddar cupcake topped with a candied pecan, honey blue cheese frosting and a crisp cheddar wafer. I couldn’t really taste the cheddar or the blue cheese, but the honey and candied pecan really shone. My friend M. ate the cheddar wafer separately and said it was deliciously intense. The flavors blended really well together, and the result was a tasty little picnic treat. It paired really well with a Lugana Base white wine, which I enjoyed immensely as well. In fact, I bought two bottles of the prosecco and a bottle of the white at the end of the night. The third course was “Wine Me, Dine Me…Make Me Sparkle,” which featured a cannoli cupcake and a red wine named Sangue di Giuda (Blood of Judas). The cannoli cupcake is an orange-scented cake with ricotta chocolate chip filling that is dipped in chocolate ganache and topped with almond cream. The cannoli cupcake was deliciously moist and decadent. I’ve recently started to appreciate almond paste and marzipan again after overdosing on it when I lived in Salzburg, Austria for a year back in 1989-1990. The almond flavoring made the cannoli cupcake shine. I will be ordering this one from Indulgence Cakes in the future. This was also about the time that the service really started slacking. 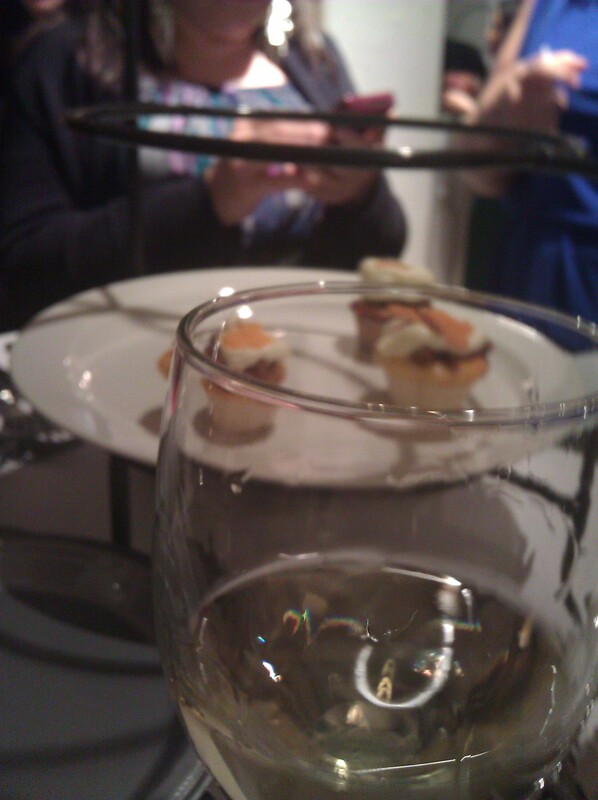 The cupcakes and wine started being served with a time lag, so we could no longer enjoy the wine with the cupcakes. It also seemed as if the servers started deliberately skipping our table, which was in the middle, and serving everyone around us first. Glasses and plates could have been cleared during the lulls between the courses, but instead were cleared by the server when she brought out the cupcake plates. The result was a delay in bringing out the wine and tables that were very cluttered with empty glasses and plates. By the end of the night I was fed up and have to admit I wasn’t very nice about it, but since the servers never cracked a smile I don’t feel too bad about it. As a former server I know how to recognize good and bad service, and no matter what happens you always need to serve with a smile (even if it is insincere). I decided never to attend another stand-up Emerging Chefs event as a result (the lack of chairs didn’t help – by the end of the night my feet and lower back were killing me). The intermezzo course “Give Me a Break” claimed we would be served sparkling spring water with a sprig of mint and mint julep panna cotta. The mint julep panna cotta was absolutely divine. 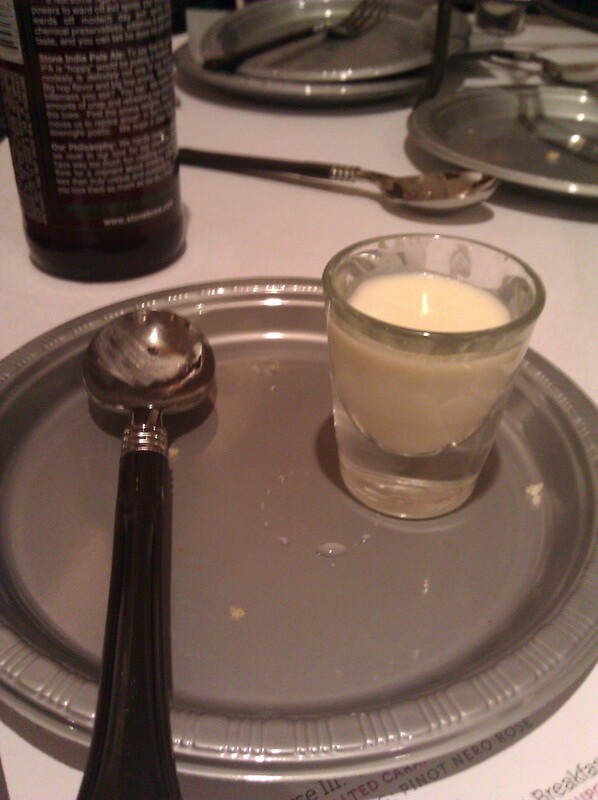 I had to use the stem of my spoon to enjoy the panna cotta at bottom of the glass. It was so refreshing and delicious that I simply didn’t want to waste any. I was dying of thirst at this point and had been looking forward to the sparkling water and mint. Sadly, we had to accost a waitress to get some water and the water was served with no mint. 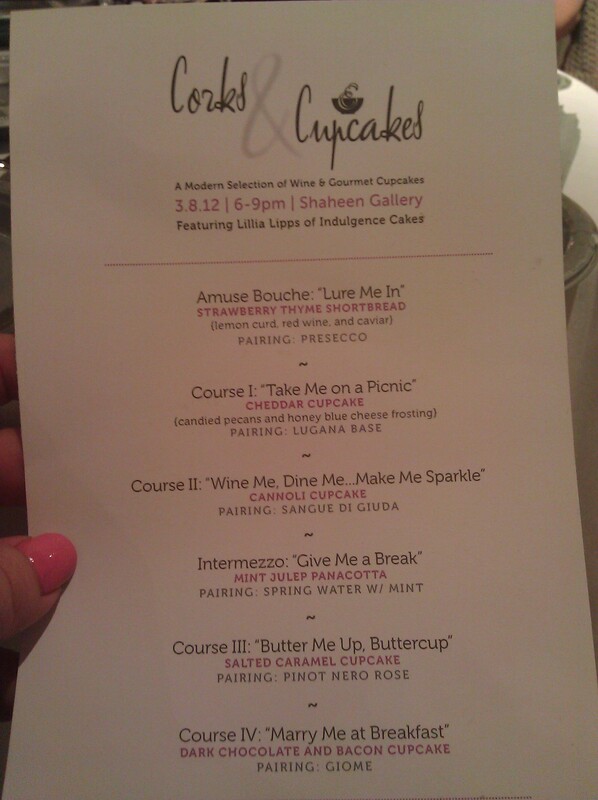 The third course was “Butter Me Up, Buttercup,” which featured a salted caramel cupcake and a Pinot Nero Rose. I became a fan of salted caramel thanks to Jeni’s Ice Cream, and this cupcake more than did the flavor justice. 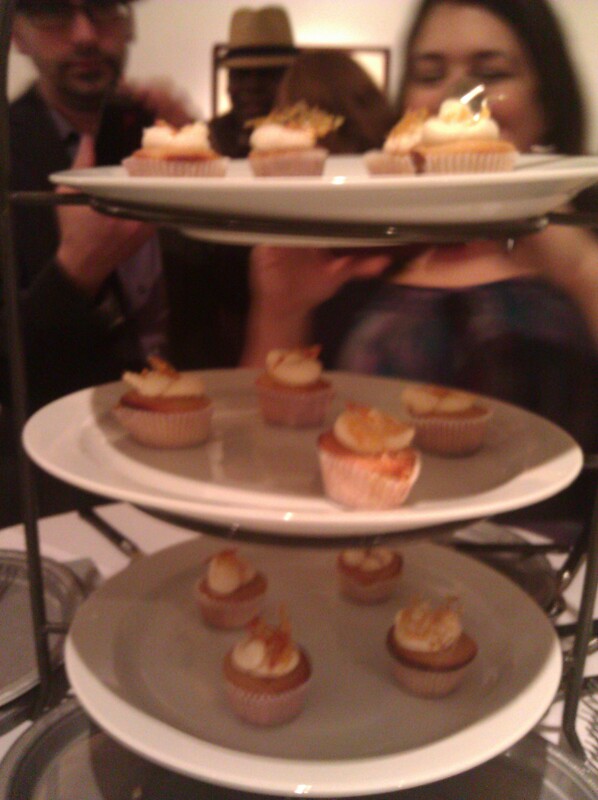 The cupcake was moist and caramelly – not to mention beautiful to look at with the crystallized sugar garnish. I’m not a fan of sweet wines (and had had two cocktails at a happy hour at Myxx beforehand), so I stopped drinking the wines at this point. I had a sip of the Pinot Nero Rose and it was good, but I left my half-finished glass on the table. 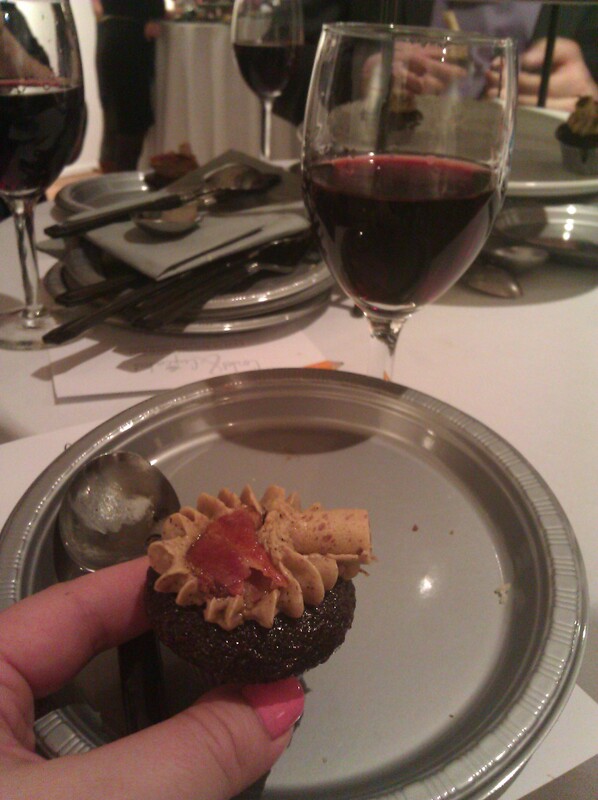 The final course was the one I had most anticipated – “Marry Me at Breakfast” featuring a decadent dark chocolate and bacon cupcake with an espresso butter cream frosting. I would marry anyone who gave me this cupcake for breakfast! At this point the room had cleared out, so I was able to enjoy two of these bad boys. I will be buying this one again too! It was heavenly – pairing dark chocolate, bacon and espresso. 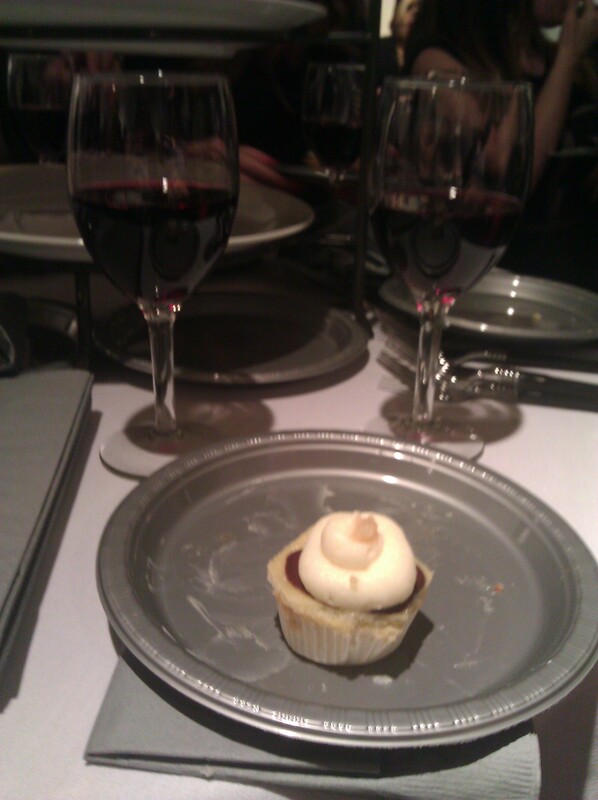 The Giome cabernet-merlot blend was a bit peppery, so when paired with my second cupcake it really made the course shine. Just thinking about it makes my mouth water. Overall I enjoyed myself. The cupcakes were delicious, and the gallery setting was very enjoyable. I had a lot of fun chatting with the girls from Scene Magazine, Crystal from Eat*Drink*Cleveland and several other people at our table, including our baker Lilia and her husband and Kimberly of Smitten in Cleveland and her husband.